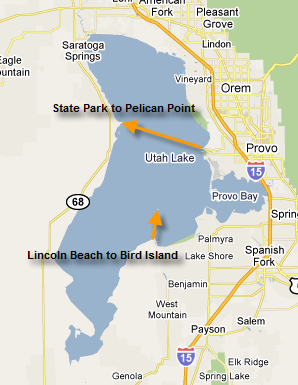 After swimming in Utah Lake last week, I started thinking about some possible swims that I could try there next year. Utah Lake seems like an obvious place for distance swimming. It is the third largest freshwater lake west of the Great Lakes (Lake Tahoe and Flathead Lake are larger). One of the swims that I am interested in doing is swimming the width from the State Park to Pelican Point. I got the idea from an article I found about Pat Christian who, for his 60th birthday, swam across the 6+ mile width of Utah Lake. Click here for his story. Karen Sigler ran into another guy at her pool who swam across the width several years ago. This swim looks to be a little less than 10K. The only thing that makes me nervous about it is that there are typically a lot of boats out on the open lake. I would definitely need to have a powerboat accompany me to keep an eye on me and make sure that I don't get hit by other boats. Another swim that I am interested in doing is much shorter. It would be from Lincoln Beach, around a small island called Bird Island, and back. The island is about 2.14 miles from Lincoln Beach so the round trip would be about 4.28 miles. I'm not sure how visible the island is from the water so I would want to have someone with me in a boat to help me navigate. Have you done any swimming at Utah Lake or know someone who has? Do you have ideas for other swims in the lake? I would love to hear from you. When are you planning on doing this? Would you settle for kayak support on the width? I'd be willing to be your support for the width crossing as long as it's on a Saturday. I could offer you GPS support so that we end up going as close to the intended path as possible. Let me know. Probably not until next year. I've got Kau Wela this weekend and Slam the Dam next weekend and then I think I'm probably done for the rest of the year. Yeah a kayak would be great! If you want to paddle for me that would be awesome! I would do it on a Saturday morning. Sounds fun! Did the Utah half in the bay! need to get some long swims in before IMSG.